1. You can only get away with drinking until 5 in the morning for so long. Let’s be honest. How often in your daily life do you come across the opportunity to totally let loose, have zero responsibilities and party until your feet fall off? If you answer every weekend, you’re probably still in college. The correct answer in the adult world, is not often. You know all those quotes saying your 20s are your selfish years? Well I fully subscribe to that philosophy and I say take advantage of those years. You will have plenty of time to settle down, pop out some kids and be responsible. But before then, it’s time to live large. A week dedicated to meeting people around the world, seeing beautiful countries, partying until the sun comes up is just what any overworked 20 something needs at least once in their life. 2. It’s a great way to explore Europe. Not many people can say they lived on a boat for a week and sailed to some of the most beautiful destinations in the Mediterranean. If they can, they’re probably a trust fund baby and #notrelatable. This is your chance to set sail and see a country you’ve never seen before in a totally new way. Traveling by boat is relaxing (when the waves aren’t rough) and it’s beautiful. 3. It’s an excuse to get all of your best friends together. In need of a reunion? Why not meet up with your besties halfway across the world? This is the perfect trip to get the gang back together and embark on a week you will never forget. Some boats on The Yacht Week can fit up to 12 people, so invite the whole crew! 4. You meet friends from around the world. This is a great one! Haven’t you always wanted to have a friend who lives in London or Sweden? That way you can say cool things like ‘Oh I can’t hangout this weekend I’m visiting my friend who lives in Kensington’. Yea, you could say that. You just need to make some cool friends first. I met so many people from all over the country and the world. We all exchanged social media handles and we all keep in touch to this day. 5. You will make all of your friends back home insanely jealous. I mean you shouldn’t do things just to make other people jealous. It’s just an added benefit lol. 6. You get to party in the middle of the ocean with 50 other boats. Right, so you know those pictures of the boats forming a circle and there’s a ton of pool floaties in the middle? You could be the one floating on that flamingo float right now. It’s a total blast to use this outrageous pool float as your boat for a day and swim up to other people on equally outrageous floats and bond over the ridiculousness of the entire situation. 7. You get out of your comfort zone. I’ll admit. Before I went on Yacht Week my experience with sailing, living on a boat and partying with strangers was limited to weekends at Lake of the Ozarks. Now, that’s a whole different kind of “Yacht Week”. So I was totally out of my comfort zone. But isn’t that kind of fun? It’s pretty cool to be able to do something you never would have thought you’d be doing and truly enjoy it. And take it from me, even if you go sailing every weekend and never get seasick, it’s a good idea to still bring Dramamine lol. Hangovers and waves don’t mix. 8. It’s like summer camp for grown ups. Didn’t you love going to sleep away camp when you were little? I thought it was the coolest thing ever. Getting to shoot a bow and arrow and cook s’mores over a campfire. But with the Yacht Week your trading in your bow and arrow for body paint and s’mores for shots. The Yacht Week is totally adult summer camp. Your skipper is kind of like your camp counselor and knows all about the best activities and where the best spot to party is. And your hostess is like the cool older girl at camp who knows how to sneak out of your cabin late at night and not get caught. Plus he or she can make a mean hangover feast. Okay, I’d be lying if I didn’t say the reason I do certain things is to get some cool photos out of it. It’s true, it’s the world we live in. Judge me, but you do it too. That being said. Wow, the photo opps are endless. 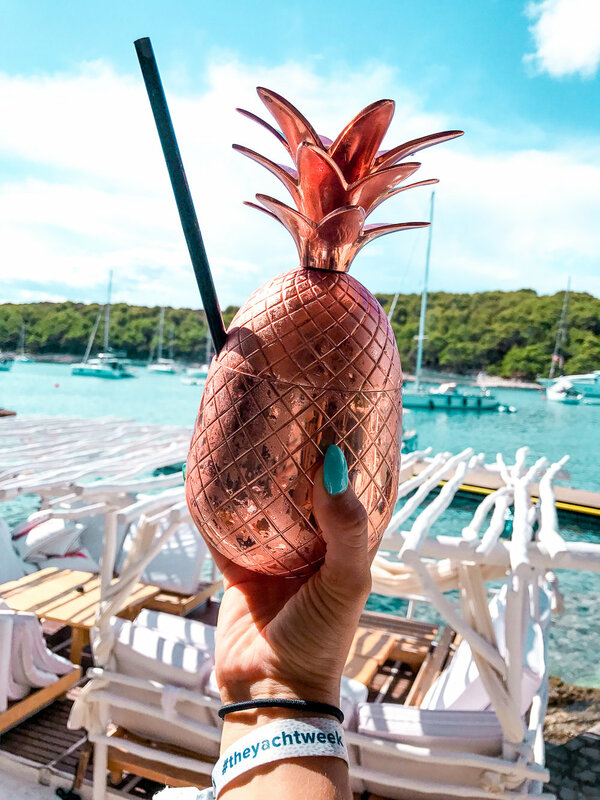 From the glistening blue waters to the themed parties each night, there’s no shortage of great Instagramable moments. Okay this is the most important one. You can choose to not go on the yacht week because you think it’s childish or you read an article that calls it “Sodom and Gomorrah at sea”. Or you can say ‘Screw it. I need to escape my 9-5 and have some fun’. I know what option I’d choose. Here’s the thing, making memories is the most important souvenir you can ever bring home. It’s how you bottle up one of the best weeks of your life and relive it any time your boss yells at you for something stupid. More than that, it’s experiences which make you grow and learn more about yourself. I know I’m laying on the cheese pretty thick right now but truly I couldn’t stop reliving all of my favorite moments from The Yacht Week for months after I came home. So here’s some of my favorite memories. I will say some I can’t share because they probably shouldn’t be written down lol. Jumping up and down like jumping beans in this itty bitty bar called Kiva Bar on Hvar. We were literally shoulder to shoulder with hundreds of people packed into this bar. I easily burned 3,000 calories, or at least that’s what I told myself. Having the most delicious and fun dinner with our whole crew at one of the local restaurants that served the authentic Croatian dish, Peka. CHECK OUT MY YACHT WEEK DESTINATION GUIDE!